It’s the first day of summer break! We’ve been counting down to this day for months! And yet, I will admit, I’ve also secretly been a little nervous about starting our summer fun. After sending our three kids back to school this past year, the transition to having all four of them home everyday is a little overwhelming. They now range in age from 3 to 12, so it’s not as easy as it used to be to find daily activities that make everyone happy. I also have to figure out how I will rearrange my work schedule to still keep up with my hours around trips to the pool and fun outings. So I’m kicking off this summer the way I always do… with a bunch of lists! I’m so crazy about my summer list making, that my awesome writer friend, Lara, even included me in an article she wrote about being prepared for summer. Talk about being organized! Her article was published here, here, here and here. I’m planning to sit down with the kids today and make our list of goals for the summer: All of the places we want to go, friends we want to see and fun things we want to accomplish. But before we do that, I revamped our system of keeping our home somewhat livable. With six people living under one roof, everyone needs to work together to keep this place from looking like a zoo. You already know that I have been working hard this past year to get our house organized, purged of unnecessary STUFF and somewhat clean on a regular basis. I’ve already involved my kids in that process by creating their “daily checklist.” This is just a simple list they can use to walk around the house, room by room, and pick up any messes they made. 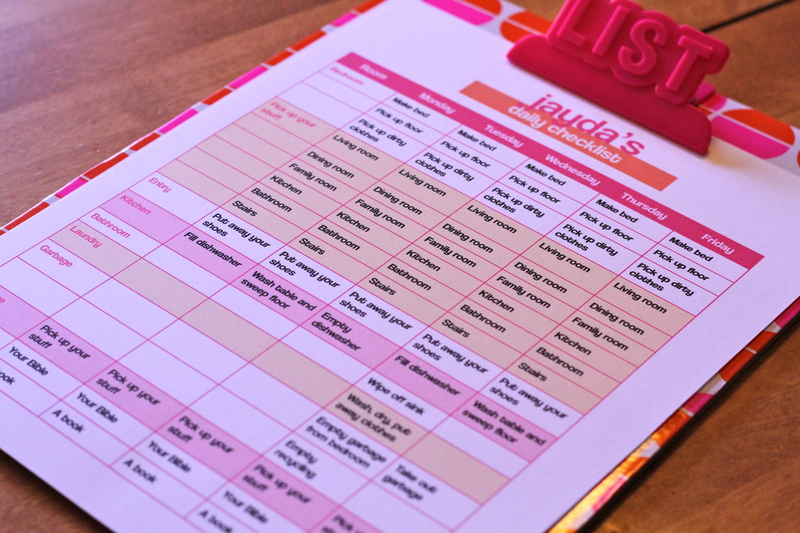 It works great because I no longer have to nag them to “pick up your shoes” or “put away the paper and markers.” I simply say, “Have you done your checklist?” I added a few things to the list for summer, like a laundry day for each child and reading a book each day. The big thing I’ve been wanting to improve on the daily checklist is to make it cuter and also to give them each a clipboard so they can keep the checklist in one spot. Since my organization obsession began, I have become an addict of the $1 section at Target. Last week, I found these super cute clipboards there for only $1, and I knew I was ready to cutify the checklist. Instead of having a laminated chore chart or something that hangs on the fridge, I simply print out a new checklist each week. I’ve tried tons of other approaches in the past, and I’ve written about many of them, but this is what’s working for me at the moment. Oh, and you might be wondering why even the 3-year-old has such a long daily checklist. Well, she can’t actually read what’s on the list, but she would be going crazy if she didn’t have her own clipboard and her own list to carry around the house. She gets to check things off at random from the list! We can even make up simple chores we want her to do and tell her they are on her list. Haha! Each child has two more lists on his or her clipboard. The second list is our weekly chores that we typically do during the school year on Saturday mornings. Believe it or not, we have never given our kids allowance or paid them for their chores. We believe that part of the privilege of getting to be part of a family and live in a cozy house is that everyone works together to take care of it. However, my kids have been begging for a way to make some money, so this summer I’m going to see how it goes to pay them for these chores. The third list is our summer Bible reading plan. All three of our big kids are now old enough to sit down and read their Bibles on their own. I wanted to give everyone the same reading list so we can talk about what we are reading. They have been memorizing parts of Ephesians at school this year, so I decided that would be a great place to start! I still need to come up with several more lists to help me feel good about kicking off summer break: my work schedule, the fun places we want to go and any other goals we want to accomplish the next three months. I would love to hear from you. Do you do anything special to stay organized over the summer? Or do you prefer to let things roll? What about involving your kids in chores? 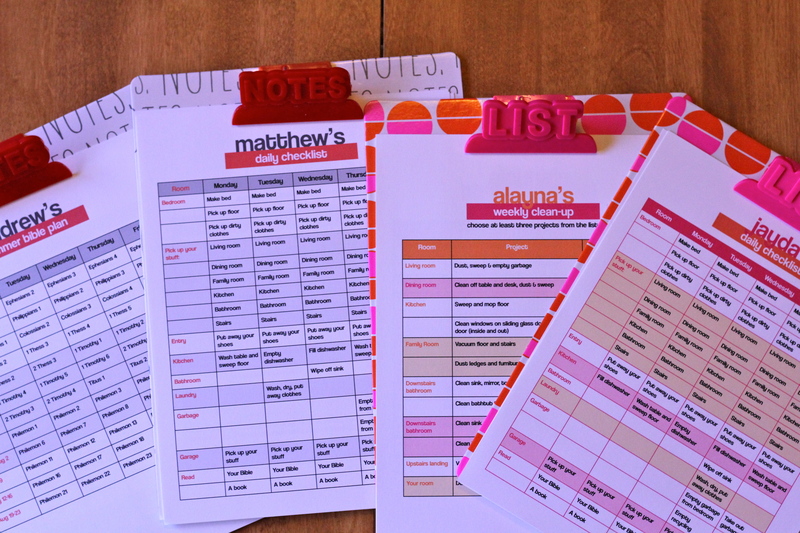 So many people have asked me for a printable of my checklists that I am making them available here. I originally created these in Pages for the Mac, but I have uploaded them here in Microsoft Word. I used the font Coolvetica. Hi, I jumped over from iheart organizing. I like those clip boards, very fun. I am still mulling our daily chores, instrument practice times, Bible reading, etc and want to make some great charts. Alas, it’s the second day of summer break and it’s still only in my head and not on paper. My goal is by the end of the week. Thanks, Melanie! I still have lots more organizing to do to get our summer started on the right foot. I hope you can come up with a great plan that works for your family! Thanks for stopping by. A few people have asked me about this today! Let me see if I can put it up as a pdf. Thanks for asking! Yes I would really love a copy of your chore checklist. I uploaded a printable of my chore checklists. Thanks! We’ve never paid our kids for chores, either, for the exact same reason, (being a valuable household contributor,) but it *is* hard to find extra things they can do to actually earn extra money sometimes. I think I need your clipboards… I hate cleaning more than anything and certainly don’t do it regularly. We usually just have a day every now & then during summer when we all break down & have to clean the whole house – kids upstairs, me down. I try new things each summer for my kids, age 15, 13 and 11. Our most successful thing was fishbowl chores. I wrote the chores for the week on notecards, folded them in half and placed it in a fishbowl. Every morning, my kids had to pick out three chores to be completed before they left the house. My kids enjoyed trying their luck for an easy chore and I was happy to not take the blame in giving someone a more difficult chore than their sibling. The downside was when they picked a chore like “empty the bedroom garbage cans” on a Monday when garbage day was Friday. It continues to be a work in progress. I love that idea, Pam! We did something very similar to that for a while. I think you need to keep changing it up to keep the kids on board! Thanks for the comment! Aimee, if you download the version in Word, you can edit the text. There is a boy version and a girl version in Word.